Ohio pork producer, crop farmer and cattle feeder Pat Hord speaks truth to power (in this case, the Humane Society (HSUS)) in the June/July 1010 issue of Progressive Farmer. In the cover story, "Taking a Stand," Hord defends his profession by saying, "we are not just raising a pig, a cow or some corn. We're feeding this country." Visit Hord Livestock's website at http://www.hordlivestock.com/. Michigan pork producer and NPPC board member, Bob Dykhuis, provided the headline for the June 14th Feedstuffs, "Many policy issues 'lurking.'" Dykhuis describes the effects of the food safety bills being considered by Congress. Steve Kerns was recently inducted into the Iowa State University Animal Science Hall of Fame. Kerns, from Clearfield, Iowa, "Has been an entrepreneur, an early adopter of technology and a leader in swine seedstock production" and "Has provided outstanding leadership for the livestock industry in Iowa and is a strong supporter of animal science programs at Iowa State," according to Maynard Hogberg, animal science department chairman. It's World PORK$HOP Expo Time! If you're attending the World Pork Expo, please stop by our booth (#735) in the air-conditioned Varied Industries Building at the Iowa State Fairgrounds, Des Moines, June 9-11, and we'll show you what's new and relevant to profitable pork accounting, production and marketing. Sometimes you have to spend money in order to save money. That's the philosophy that Lexington, Nebraska grower, Don Anthony, when he converted 140 acres to subsurface drip irrigation, in spite of the fact that its capital cost is twice that of the most popular alternative, center-pivot. You can read the story in the Mid-March, 2010 edition of Successful Farming (not available on-line). According the the article, "Anthony is a precise record keeper, and he has examples of how drip irrigation can actually be quite cost effective." Do you have your own example of how you've used information from FBS software to solve a challenging or complex problem or support a decision? Please share it with our readers! 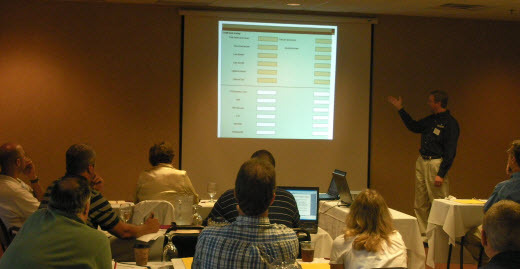 The annual FBS User Conference returns to the Stoney Creek Inn on the Mississippi waterfront, Moline, Illinois, with a fresh and relevant program that will appeal to both experienced and novice users alike. The 2 1/2-day format on August 24-26 will be segmented into special-interest breakout sessions that allow participants to choose the days/classes they wish to attend. We'll have more instructors, user round tables, guest speakers, new product announcements, plus a few surprises. Capping it off will be a special awards banquet to celebrate 30 years of progress in agricultural computing. Please save these dates, and watch for details in the mail and this blog site.